Arrested? 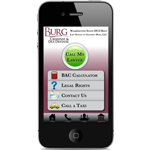 Know & protect your rights with our app! Our phone number for 24/7 access. This goes directly to our cell phones. Breath test calculator to make sure you don't drink too much. Your legal rights. Show this to police if you have been contacted by them - it will make sure you don't give up any rights!